Veerashaiva College Ballari - A Special Lecture on the Topic “Expecting the unknown and the Physics of Atlas Experiment at CERN"
A Special Lecture on the Topic “Expecting the unknown and the Physics of Atlas Experiment at CERN"
“Expecting the unknown and the Physics of Atlas Experiment at CERN"
A special talk on Big Bang Theory and Atlas Experiment at CERN was organized by the Department of Physics 25/01/2019. 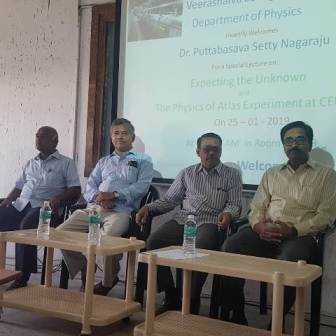 Dr.Puttabasava Setty Nagaraju, Retired Professor, Indian Academy College, Bengaluru, delivered an elaborative talk on Atlas Experiments conducted at CERN, Geneva. He spoke about various experiments conducted to discover the unknown things regarding the evolution of earth. He also explained about a Big Bang Theory, God particles and other new experiments and researches conducted by the Scientist till recent days. 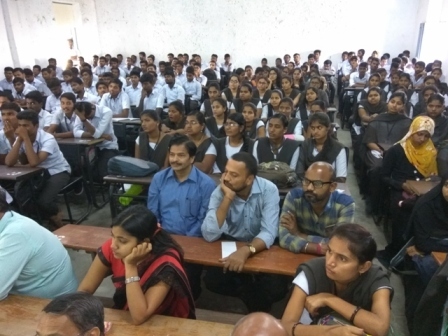 Dr.G.Rajashekhar, Principal, presided over the function. Prof.M.Bhojaraja proposed vote of thanks. Ms.A.Shirley Jones welcomed the guests. Dr.K.C.Sajjan introduced the Chief Guest. Kum.Nirupama Matad sung invocation song. /A Special Lecture on the Topic “Expecting the unknown and the Physics of Atlas Experiment at CERN"